It was over 150 years between the first printing of The Treastise of Fishing with an Angle and the next significant literary work, The Compleat Angler by Izaak Walton. In the pastoral landscape that was England in the 17th century Izaak Walton strode impressively onto the scene and left an imprint on angling and angling literature that persists to this day. Perhaps no other book on angling is as well known as his Compleat Angler, however I would wager that of the many people who recognize the title have never attempted to read the book. Between Berners and Walton's time there were no major advances in fly-fishing. Many of the techniques set forth by Walton are mere restatements of the same techniques found in The Treatise. Walton also leans heavily on the writings of other authors that wrote during the 150 years between Berners and himself. There were five fishing books published between the Treatise of Fishing with an Angle and Walton's Compleat Angler. In 1577 The Arte of Angling was published by an unknown author, A Booke of Fishing with Hooke and Line, by Leonard Mascall was published in 1590. In 1613 John Dennys wrote The Secrets of Angling, which is remarkably similar in style to Walton's work. The fifth work, The Arte of Angling, by Thomas Barker was published in 1651, just two years before The Compleat Angler. While much of what appears in Walton's work appears to be heavily borrowed from the works of several of these authors such plagiarism was common practice during this period. It is interesting to note that Walton wrote nothing particularly original about fly-fishing or fishing in general; his book is the best-known book on sport in the entire English literature. The book centers on a conversation between Venator, a hunter, and Piscator, an angler. These conversations take place over five days, and include conversations between other individuals that they encounter along the way. These conversations are interrupted at various points by poems, anecdotes and songs. These were troubled times in England. Charles I had been executed, and England was torn by warfare between the Royalists and Cromwell. In the midst of this upheaval Walton wrote his pastoral idyllic. Espousing reverence for nature and high moral standards Walton painted a picture of the perfect angler, a mixture of contemplative scholar and a jovial adventurer. It was a man by the name of Charles Cotton who truly made Walton's later editions of The Compleat Angler of special interest to fly-fishers. In the sixth edition of Walton's book published in 1676 a second book, written by Charles Cotton, entitled Being Instructions How to Angle for a Trout or Grayling in a Clear Stream was added. This appendix contained an original set of fly patterns that enshrined Cotton as the father of modern fly-fishing. Although his knowledge of entomology was plagued by all the misunderstandings that were prevalent at the time he did recognize that fly hatches came from larval forms that he observed on the rocks and weeds in the river. He believed in matching the hatch, and outlined a list of sixty-five original patterns for the entire season on the Dove. If you were to read Cotton's description about fly tying you would find it surprisingly modern. There were other authors during this period, but mostly they were minor volumes when compared with Cotton's work. Notable among these authors is Francois Fortin who published Les Ruses Innocentes in 1660. Fortin was a friar, and he wrote the first description of eyed hooks two centuries before Halford and Hall perfected the necessary metallurgy and manufacturing techniques to make them practical. His woodcuts contained a depiction of a crude spindle-stick reel and a triangular landing net, which apparently he invented centuries before the modern version that is popular in England and France. Robert Venables is another notable in 1662 he published his Experienced Angler Venables was the first to write about the fact that trout take time to adjust to a new hatch, that they respond best after the flies have been hatching for a while, and that trout can become selective when feeding on a specific hatch. He wrote about upstream presentation, and understood that a man fishing upstream could get much closed to a fish and that a fish downstream from an angler could detect his presence from a considerable distance. He experimented with gut leaders that he took from musical instruments. The last important contribution to seventeenth century angling literature is The Angler's Vade Mecum written by James Chetham and published in 1681. 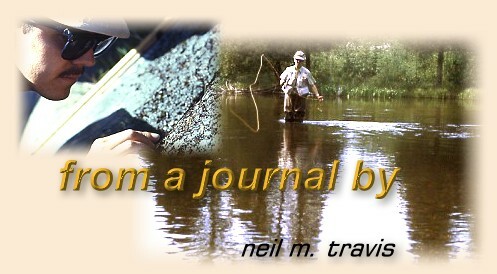 Although he was a great plagiarist, copying much of his material from earlier writers like Cotton, he did produce a practical manual on fly-fishing. His patterns were keyed to seasonal hatch cycles, he listed practical advice on materials for fly tying, and his original patterns include the March Brown, Grannom, and the classic Blue Dun. He believed in witchcraft, and his book contains such odd things as ointments made from cadavers and human skulls. Robert Howlett published his work The Angler's Sure Guide in 1706, and marked the earliest eighteenth century work of note on fly-fishing. Howlett's work is filled with tactical observations that still are true today. Richard Bowlker and his son Charles wrote what is perhaps the most outstanding book of the eighteenth century. The Art of Angling was first published around 1747, and went through sixteen editions. Original credited to Richard Bowlker, by the third edition the sole credit for the work was given to Charles. Charles is credited as being the finest fly-fisherman of his century. He wiped away the mythology of earlier fly-tying practices, and made impressive contributions to the anglers understanding of trout stream entomology. His versions of patterns like the Blue Dun, Cowdung, Willow Fly, Grannom, Yellow Sally, Green and Gray Drake, and the Black Gnat are very similar to patterns still in use today. The fact that these flies have survived over two centuries virtually unchanged is a remarkable testament to the talent of Charles Bowlker.